This past Sunday, September 3, brought the very sad news that John Ashbery had passed away at the age of 90. 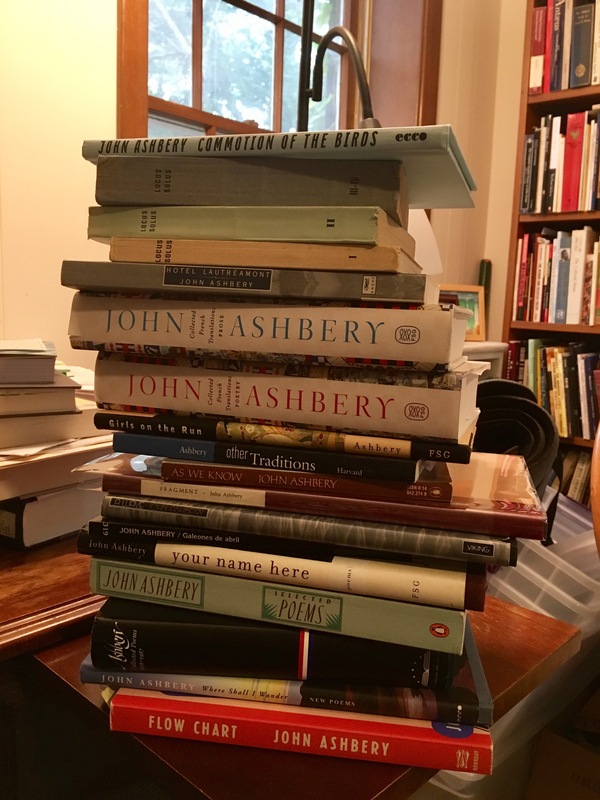 Ashbery has long been regarded as the greatest and most influential living American poet, so it is not surprising that the last few days have seen an outpouring of grief and praise from all corners of the literary community, and a slew of fine obituaries and tributes (I’ve collected many of these below). I was grateful that the New York Times also asked me to suggest a few favorite shorter poems to accompany their obituary for Ashbery, which you can see here. Even though he had just turned 90 in July, it somehow felt as if Ashbery would always be here, like crazy weather (“falling forward one minute, lying down the next”) – churning out a new book every year or two, exhibiting his wonderful collages, blurbing younger poets, generally filling the air of contemporary poetry with his brilliant presence. So his loss still came as a shock, a sharp blow, despite his extraordinary, long career and full life. One reason Ashbery’s death seems so significant and painful is that it marks the real end of an era: he was one of the last of the great figures associated with the adventurous, avant-garde movement that emerged after World War II known as the “New American Poetry.” And more broadly, he was one of the final living poets belonging to the amazing generation born around 1925 to 1927 (a roster of illustrious names that includes Kenneth Koch, Jack Spicer, Frank O’Hara, James Merrill, James Wright, Adrienne Rich, Robert Creeley, Allen Ginsberg, A. R. Ammons, Galway Kinnell, and many more). Ashbery was also, of course, one of the last surviving members of the New York School’s legendary first generation. He outlived virtually all of his original close companions: Frank O’Hara, who died 51 years before him, Fairfield Porter, James Schuyler, Kenneth Koch, Larry Rivers, Barbara Guest, Jane Freilicher, Harry Mathews – they all went into the world of light before Ashbery himself, a poignant fact that often surfaced subtly and wistfully in his later work. Because Ashbery is such a towering figure, I’ve found it hard to know where to begin or what to say that would be adequate to mark his passing. On a personal level, his work has been of such vital importance to my own writing and thinking for so long that his loss seems too huge to encapsulate or sum up, so I’ve decided I’m not going to really try here. It did occur to me, as news of his death sank in, that I’ve been reading and writing about Ashbery continuously for 25 years and that his “philosophy of life”; his sensibility and sui generis voice; his distinctive, hilarious, tragic and consoling way of looking at the world and its absurdities and pains; not to mention countless beautiful, moving, and strange lines of his poetry have all seeped into my consciousness, quietly affecting how I think and relate to my own experience in ways I can’t really articulate. 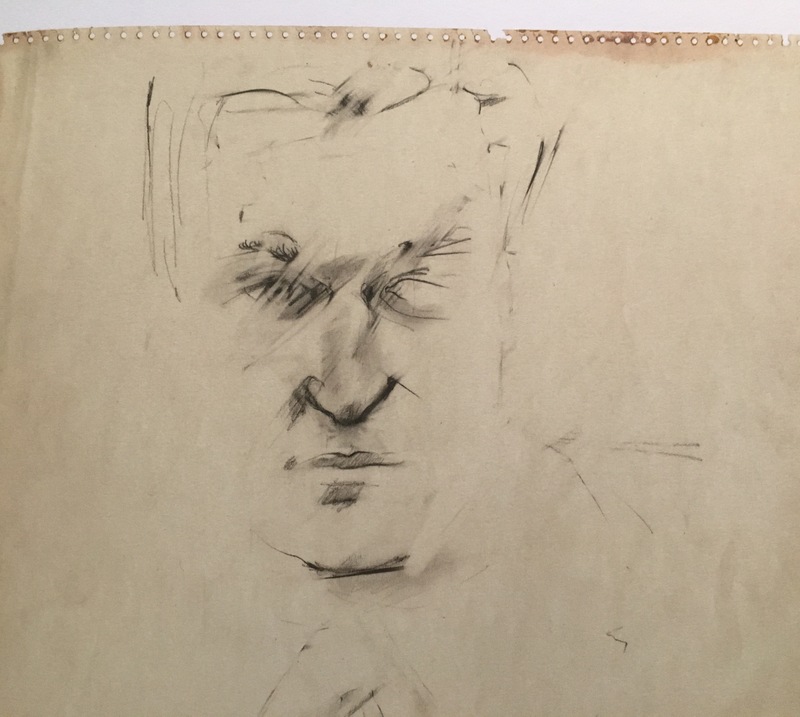 As an undergraduate at Harverford College in 1991, I took a bus over to nearby Bryn Mawr College by myself one evening to see Ashbery read from his new book-length poem Flow Chart, in a dim, grand hall, and came away equal parts mystified and inspired. A few years later in graduate school at Columbia University, I had the good fortune of working closely with one of Ashbery’s closest friends, Kenneth Koch. The first day I met Koch and began working as his assistant, he immediately informed me, half-jokingly, that Ashbery was his “greatest living rival,” and quickly convinced me that no poet was more important or better than Ashbery, whose work he absolutely revered. I studied Ashbery’s poetry in my courses, wrote seminar papers on his work, and eventually decided to make him one of the main subjects of my doctoral dissertation (though Koch did half-jokingly wonder why I wasn’t focusing on him instead). One of my first published reviews was a piece about Ashbery’s book-length poem Girls on the Run, which appeared in the American Book Review in 2000. Ashbery’s work was at the center of my first book, Beautiful Enemies: Friendship and Postwar American Poetry, which delved into his ideas about the self, interpersonal relationships, and his philosophical connections to Emerson and American pragmatism, and explored the close, complex personal and poetic “sibling bond” at the heart of his relationship with Frank O’Hara. More recently, I contributed a chapter about Ashbery for The Cambridge Companion to American Poets and then, just a couple weeks ago, my review of Karin Roffman’s new biography of his early life appeared in the New York Times Book Review. Not surprisingly, Ashbery has also been a regular fixture on this humble blog about the New York School – in fact, I realized I’ve written 100 posts about, or at least touching on, Ashbery since I began this site in 2013. (To sample some of these posts – which range from pieces about important Ashbery poems like “Pyrography” or the time Ashbery smoked a joint with Elizabeth Bishop to the recent show where Patti Smith paid tribute to “my Ashbery year”, see here). I’m sure there will be many more, just as there will always be more essays and books devoted to Ashbery’s poetry, just as there will always be young writers who will revel in his influence and be fueled by his spirit as long as there are poets writing poetry. For now, there is the sustaining tower of books and words he left behind. To live afterwards, in sunlight and shadow, a certain amount of years. Moving on towards death. But sometimes standing still is also life. And here, finally, is Frank O’Hara’s beautiful, now extra-heartbreaking 1954 poem “To John Ashbery,” in which he imagines himself and “Ashes” (his affectionate nickname for Ashbery) reading their “new poems to each other / high on a mountain in the wind,” like a pair of ancient Chinese poets. as we watch snow settle on a twig. is not the grass I saw in my youth! Rest in peace, Ashes, little J.A. This entry was posted in Allen Ginsberg, Barbara Guest, Fairfield Porter, Frank O'Hara, Harry Mathews, In Memoriam, Jack Spicer, James Merrill, Jane Freilicher, John Ashbery, Kenneth Koch, Larry Rivers, Mark Ford, Robert Creeley. Bookmark the permalink. As always, lovely, Andrew. I love reading your all your posts. Thoughtful and as beautiful as the output of the poets we both love so dearly. I’m trying to decrease my fb footprint so it’s great to receive these posts in rmail format too. Thank you so much for reading and for your kind words, Mandana. Thanks for the obituaries you listed. The very day he died I was at my local library renewing Breezeway. I’m in the middle of reading the biography of his early days. Today I listened to several you tubes where he is featured. The last time I saw him in person was at the memorial to Jane Freielher sp? One of the videos was J.A. in her studio. That was time I first heard him read at the Poetry Project at St. Mark’s. My favorite t.a Mandana undertook a study group about him for Mod Por. I loved visiting his home in Hudson thanks to the virtual reality link you provided. Andrew, as a hurricane bares down on Florida be safe be strong! Thanks very much for reading and for sharing your experiences with Ashbery. I think your TA Mandana may have commented just above you. And thanks for the good wishes about the hurricane — we’re bracing ourselves and hoping for the best! Did you see the article about JA in the most recent issue of The American Scholar magazine (put out by Phi Beta Kappa)? I think it is so excellent and thoughtful. Please can I ask a favour? In the days after Ahbery’s death I read a brilliant piece on him, online, by Marjorie Perloff (I think it was a review of Notes From the Air), but now can’t find it anywhere. Would you have a link for it at all? Thanks for your note. I’m not sure of the exact piece you’re referring to — and Perloff has written about Ashbery in many different essays and reviews over the years, including a brief memorial tribute here (http://bostonreview.net/poetry/marjorie-perloff-john-ashbery-staying-motion). But she did indeed review “Notes from the Air” for Bookforum, and you can find it here: http://www.bookforum.com/inprint/014_04/1378. The only problem is it is behind Bookforum’s paywall, so I’m not sure how you saw it after his death — maybe someone posted it online? In any event, hope that helps. I’m pretty sure this was the one. But it wasn’t behind the paywall when I saw it. Oh well, I’ll keep looking. As ever in gratitude for your wonderful blog.